This gas furnace has an AFUE rating of up to 95%, which means that up to 95 cents of every $1.00 of heating energy expense warms your home. 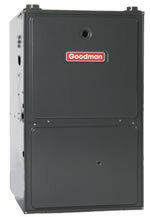 This furnace is covered by what we believe to be one of the best warranties in the indoor home comfort industry. In addition to covering the heat exchanger with a Lifetime Limited Warranty* to the original, registered homeowner, if the heat exchanger fails during the first 10 years of ownership, we will replace the entire unit for as long as you own your home. This furnace also has a 10-Year Limited Parts Warranty* on all furnace parts. For a full description of all warranties applicable to this product, please call us. This gas furnace has an AFUE rating of up to 93%, which means that up to 93 cents of every $1.00 of heating energy expense warms your home. This furnace is covered by what we believe to be one of the best warranties in the indoor home comfort industry. In addition to covering the heat exchanger with a Lifetime Limited Warranty* to the original, registered homeowner, if the heat exchanger fails during the first 10 years of ownership, we will replace the entire unit for as long as you own your home. This furnace also has a 10-Year Parts Limited Warranty* on all functional parts. For a full description of all warranties applicable to this product, please call us. 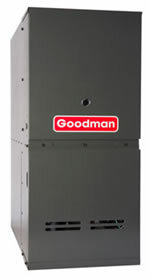 Unlike conventional, single-stage furnace technology, Goodman’s DualSaver technology eliminates the temperature swings resulting from abrupt, high-stage stops-and-starts of the furnace by operating at a low heating state the majority of the time. This gas furnace has an AFUE rating of up to 95% which means that up to 95 cents of every $1.00 of heating energy expense warms your home. In addition to covering the heat exchanger with a Lifetime Limited Warranty* to the original, registered homeowner, if the heat exchanger fails during the first 10 years of ownership, we will replace the entire unit as long as you own your home during this time. This furnace also has a 10-Year Parts Limited Warranty* on all functional parts. For a full description of all warranties applicable to this product, please call us. This furnace is covered by what we believe to be one of the best warranties in the indoor home comfort industry. In addition to covering the heat exchanger with a Lifetime Limited Warranty* to the original, registered homeowner, if the heat exchanger fails during the first 10 years of ownership, we will replace the entire unit as long as you are living in the home. This furnace also has a 10-Parts Year Limited Warranty* on all functional parts. For a full description of all warranties applicable to this product, please call us. •This gas furnace has an AFUE rating of 92.1%, which means that 92 cents of every $1.00 of heating energy expense warms your home. Unlike conventional, single-stage furnace technology, Goodman’s DualSaver technology eliminates the temperature swings resulting from abrupt, high-stage stops-and-starts of the furnace by operating at a low heating state the majority of the time. This gas furnace has an AFUE rating of up to 92.1% which means that up to 92 cents of every $1.00 of heating energy expense warms your home. If the heat exchanger ever fails in this unit, the original registered owner will receive a new heat exchanger. This furnace also has a 10-Year Parts Warranty* on all functional parts. For a full description of all warranties applicable to this product, please call us. 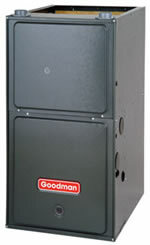 If you want we consider the best 80% AFUE gas furnace that the Goodman® brand offers, but don’t need the efficiency provided by a 90% furnace, install this furnace and enjoy the energy and money savings year after year. This gas furnace has an AFUE rating of 80%, which means that 80 cents of every $1.00 of heating energy expense warms your home. 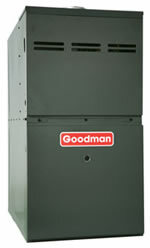 This gas furnace is covered by what we believe to be the best warranties in the indoor home comfort industry. If the heat exchanger ever fails to the original, registered, homeowner we will provide a new furnace. This furnace also has a 10-Year Parts Limited Warranty* on all functional parts. For a full description of all warranties applicable to this product, please call us. If the heat exchanger ever fails in this unit, the original registered owner will receive a new heat exchanger. This furnace also has a 10-Year Parts Limited Warranty* on all other functional parts. For a full description of all warranties applicable to this product, please call us.